Selenium is a cofactor of enzymes that release active thyroid hormone in cells and therefore low levels can cause similar signs and symptoms as iodine deficiency. The other important function of selenium is as an antioxidant. Around twenty-five known proteins require selenium to function. Some are enzymes involved in detoxifying free radicals and include glutathione peroxidases and thioredoxin reductase. 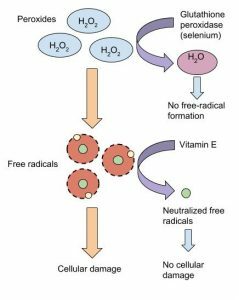 As an integral functioning part of these enzymes, selenium aids in the regeneration of glutathione and oxidized vitamin C. Selenium as part of glutathione peroxidase also protects lipids from free radicals, and, in doing so, spares vitamin E. This is just one example of how antioxidants work together to protect the body against free-radical induced damage. Other functions of selenium-containing proteins include protecting endothelial cells that line tissues, converting the inactive thyroid hormone to the active form in cells, and mediating inflammatory and immune system responses. Observational studies have demonstrated that selenium deficiency is linked to an increased risk of cancer. A review of forty-nine observational studies published in the May 2011 issue of the Cochrane Database of Systematic Reviews concluded that higher selenium exposure reduces overall cancer incidence by about 34 percent in men and 10 percent in women, but notes these studies had several limitations, including data quality, bias, and large differences among different studies. Additionally, this review states that there is no convincing evidence from six clinical trials that selenium supplements reduce cancer risk. The IOM has set the RDAs for selenium based on the amount required to maximize the activity of glutathione peroxidases found in blood plasma. The RDAs for different age groups are listed in Table 11.6 “Dietary Reference Intakes for Selenium”. Organ meats, muscle meats, and seafood have the highest selenium content. Plants do not require selenium, so the selenium content in fruits and vegetables is usually low. Animals fed grains from selenium-rich soils do contain some selenium. Grains and some nuts contain selenium when grown in selenium-containing soils. See Table 11.7 “Selenium Contents of Various Foods” for the selenium content of various foods. Selenium by University of Hawai’i at Mānoa Food Science and Human Nutrition Program is licensed under a Creative Commons Attribution-NonCommercial-ShareAlike 4.0 International License, except where otherwise noted.